Teresa Benoit Law | "It's Your Right To Fight"
Do you need to hire an injury attorney? If you or a loved one has been involved in an accident or were injured because someone else was negligent or reckless, then this is an important question that you may ask. Without legal counsel, you may not obtain the full compensation and/or benefits you may be entitled to under the law. An experienced attorney will assess the facts of your situation and advise you of your rights. An attorney will also be able to utilize resources to investigate the matter and find proof of the other party's liability, as well assist in determining the true worth of your claim. 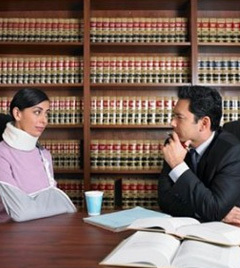 Talking to an injury attorney at our law firm is an important step to take soon after an accident or injury. At Benoit Law we are committed to providing our clients with experienced legal counsel and compassionate, attentive client service. When you contact our office, we will dedicate the time to talk to you about your experience. We will answer your questions and will address your concerns; providing the legal counsel you need to make your own decision about hiring an attorney and proceeding with a claim and/or lawsuit. A workplace injury can do more than cause physical and emotional harm.